The Manchester Blitz was relatively short, lasting two nights in December 1940, when around 1,000 people were killed and more than 3,000 injured in the city centre, Salford and the residential areas near Old Tra­fford. This book focuses on the reaction by the local and regional newspapers of Manchester, which was Britain’s second press centre at the time, to this heavy bombing. The newspapers, the Manchester Guardian, Manchester Evening News and Evening Chronicle, were studied over an eight-week period before and after the Blitz and, according to these editions, their readers were unbowed by the death and destruction wrought by the Luftwa­ffe and had a steely determination to win the war. Contemporary writing, including individual diaries and reports from Mass Observation and Home Intelligence, tells a more complicated and nuanced story. This book by Guy Hodgson explores the gap between reality and what appeared in print when Mancunians stopped being distant observers and became the story. War Torn: Manchester, its Newspapers and the Luftwaffe's Blitz of 1940 (by Guy Hodgson), by Tom O'Malley, Media History, 22(1), 137-139, 2016. The e-book (ISBN 978-1-908258-31-1) is currently available through Google Play, ebrary, EBL, EBSCO, Ebook Central, Gardners and Dawsonera. The subject of the press in Britain during World War II is relatively neglected in historical writing. Much has been written which refers to it, but as yet there is no detailed account of how the national and provincial press and periodical industry functioned during this period of intense political, military, economic and social strain. Guy Hodgson's study contributes to the redressing of that deficiency in an account of the way the Manchester press covered the Blitz in Manchester during December 1940. ... for anyone wishing to think about the complexities of the role of the newspaper press in the UK during the Second World War, this book is essential reading and points to the need for far more work on this important subject. War Torn: Manchester, its Newspapers and the Luftwaffe's Blitz of 1940, (by Guy Hodgson), by Alexandre F. Caillot, H-War, H-Net Reviews, October, 2015. Hodgson’s concentrated approach and regional emphasis on Manchester do not hinder the broad relevance of the volume. Its conclusions are pertinent to readers around the world: the importance of factual reporting, the dangers of propaganda justified by military exigencies, and the challenges of discovering the voices of the population. Anyone engaged in the study of history or journalism will find this discussion of great interest. Furthermore, the resulting contribution to the historiography will challenge scholars to carefully evaluate the agendas of their sources. Over the past several decades, historians have sought to expand the discussion of military history to encompass war and society. Guy Hodgson’s War Torn: Manchester, its Newspapers and the Luftwaffe’s Blitz of 1940 ably demonstrates the potential for wide-ranging scholarship of considerable appeal to academics and the public alike. To appreciate the transformative effect of conflict on a population, probative research into civilian-military relations can go far towards drawing together what are sometimes (and unfortunately) considered separate topics. This book accomplishes that goal, revealing the vast metaphorical gulf between a people’s wartime experience and the stance taken by the government in such a time of crisis. 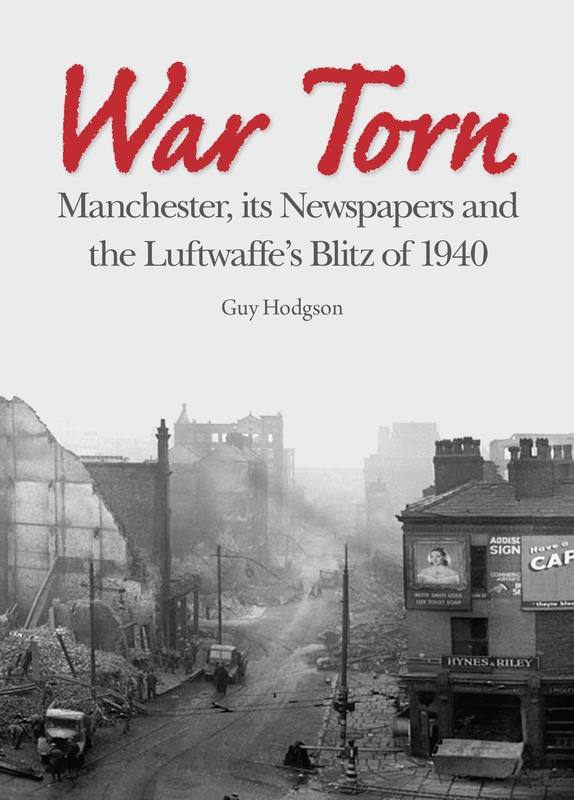 Guy Hodgson, War Torn: Manchester, its Newspapers and the Luftwaffe's Blitz of 1940, 2015, ISBN 978-1-908258-16-8, £14.99. The e-book (ISBN 978-1-908258-94-6) is currently available through Google Play, ebrary, EBL, EBSCO, Ebook Central, Gardners and Dawsonera.